Penang is the best city to work. This is your guide to work in Penang and the best jobs board to find Part-Time, Full Time, Professional and Freelance Job. 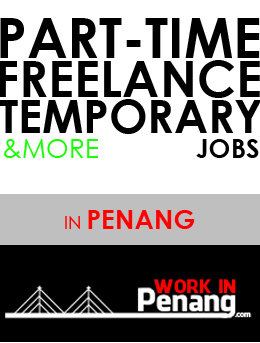 Jobs tagged "part time at puchong"
WORK IN PENANG is an exclusive jobs site for jobs in Penang; ranging from corporate, retail, to freelance and more. The site aims to provide a platform for the people of Penang, and also to those who wishes to work in Penang to find their ideal careers. We have a wide database of company who is looking for workforce everyday e.g. promoter, event crew, retail operation, sales, F&B and more. Find your idea part-time, temporary, freelance, full-time jobs and more based in Penang here for FREE! Looking for work forces, professionals, promoters, event helpers and people for your business and corporate company in Penang? Submit your job listing here for FREE now. This is a job boards for jobs in Penang only.